Nigeria has had a checkered political and economic history Like many other African countries, it won its independence in 1960, and went on to install a parliamentary democracy akin to Britain’s. This era, known as the first republic, lasted from 1960 to 1966 and was marked by ethnic tensions, poor governance and corruption. Plotters used corruption as a reason to justify military coups in 1966 and 1967, whose aftermath threw the country into a civil war. Both the coups and the war paved way for almost three decades of military rule, interrupted only briefly from 1979 to 1983 when General Olusegun Obasanjo returned the country to civilian rule. Shortly after, the 1983 coup of General Muhammadu Buhari ensured that the military stayed in control of political power until 1999, when democracy returned to Nigeria. The years of military rule were politically and economically disastrous for Nigeria. Corruption, already swelling under the early politicians, became entrenched under military rule, and a class of anti-intellectual politicians came into being. The impression is that military era squandered every amount of fiscal responsibility left by the British colonialists at the wake of independence in 1960. One of the widely referenced international scale on the “purity” of countries is the yearly corruption perception index (CPI) published by Transparency International. Over a 18-year record, Nigeria hasn’t performed well. From this, it would be either self-serving or narcissistic to deny the claim by the former Prime minister of United Kingdom, David Cameron that: Nigeria is fantastically corrupt. Though harsh, the evidence is consistent that Nigeria is convincingly corrupt. So, who will bell the cat? By the 2017 estimations of the United Nations Office on Drugs and Crime (UNDOC): after the high cost of living and unemployment, Nigerians consider corruption to be the third most important problem facing their country, well ahead of the state of the country’s infrastructure and health service. As Dr Ngozi Okonjo-Iweala showed in her recent work, billions of dollars have gone missing under several administrations since as far back as 1978. What an iniquitous record of corruption! Not only in developing nations, the extent to which corrupt practices affect markets and governments is difficult to ascertain. Nonetheless, the consequences of corrupt practices cannot be overemphasised. Corruption skews public investment away from service delivery and social amenities toward “lucrative areas” such as gigantic construction projects — dams, road construction, etc. It is an open secret that perceptions of rampant corruption contribute to public disillusionment and undermine both the legitimacy and effectiveness of governments. 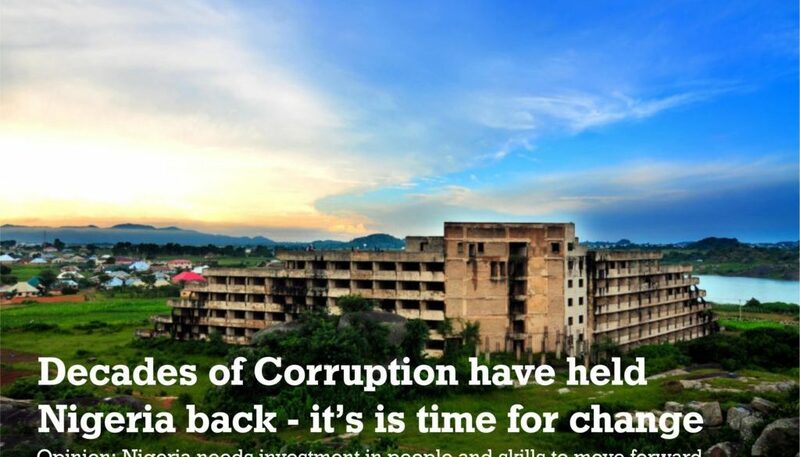 Corruption further degrades democratic values of accountability, justice and fairness. A new report by the World Poverty Clock shows Nigeria as the capital of extreme poverty in the world. The failure to lift citizens out of poverty is an indictment on successive Nigerian governments which have mismanaged the country’s vast oil riches through incompetence and corruption. The 86.9 million Nigerians now living in extreme poverty represent nearly 50% of the entire population. In a related development, Nigeria also doubles as the country with the highest number of out-of-school children in the world — a ticking time bomb waiting to explode. It is outrageous that Nigeria, a member of the Organisation of Petroleum Exporting Countries (OPEC), the fifteenth-largest oil producer in 2016, with the world’s eleventh-largest oil reserves and the ninth-largest natural gas reserves, is one of the most difficult places to support shared prosperity. Will Nigeria survive the corruption hurricane? Nigeria’s natural resource wealth has not delivered the dividends of democracy because key institutions remain weak or non-existent. It is believed that kleptocratic politicians are hell-bent on exploiting institutional vacuums. Drawing from abundance of diagnostics, for Nigeria to fight corruption successfully, concerted efforts must be made to build institutions, systems and processes that enhance transparency and make corrupt practices more difficult in the first place. It must block revenue leakages while adopting appropriate budget processes and mechanisms that permit transparency and inclusiveness. Political will must be seen and mobilized against pervasive corruption and lawlessness before the country slips permanently into irreversible coma or anarchy. The task of cleaning up the stench of corruption in Nigeria is monumental, not unlike the challenge of Hercules cleaning the Augean stables. Due to size and economic importance, Nigeria matters, not just for West Africa or even Africa, but the world. This is why good political and economic governance is essential and why the world must lend its support to ensure that Nigeria moves onto the right development path. Domestically, Nigeria must pursue its unfinished economic reforms and, thereafter, commit to investments in critical infrastructure and human capital development. There must also be investor-friendly policies that will attract foreign direct investment, add value to primary products for export and drive economic diversification. These and many others are prerequisites for sustained growth and economic development. To successfully overcome corruption in Nigeria and Africa at large, it requires the careful, determined, civic-minded and collective action of many members of the community. *This article was originally published on Apolitical. Apolitical is a global network for government, helping public servants find the ideas, people and partners they need to solve the hardest challenges facing our societies.